Keys for Kids Radio - 24/7 Streaming Music and Audio Drama for Kids! - Love Is Patient - Love Does Giveaway! 1 Cor. 13:4a Love is patient. Do you ever find yourself asking, “Are we there yet?” Waiting can be hard (especially on long road trips!) and you might get fed up with sitting around being bored when you know something so much more exciting is coming. I know it’s hard to wait patiently. When you find yourself in that tough waiting time, you can show love to the people around you by not bugging your mom or dad with the same “Are we there yet?” question or asking “Can we leave now?” a bunch of times when they’re talking to other grown-ups. Another way to show love by being patient is to wait your turn for something you want. You can do this when you’re waiting in line at school or waiting for your turn on your family’s tablet, or at other times. You can show love then by letting the other person finish without yelling at them to hurry up or demanding to have your turn right away. 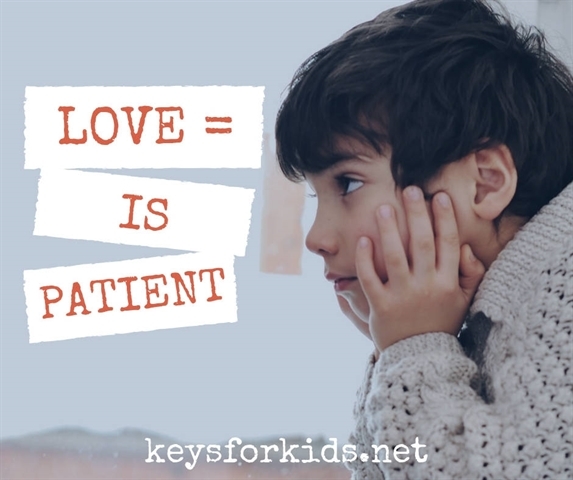 You can come back to What’s Up on keysforkids.net over the next two weeks and learn more ways to show love to others from 1 Corinthians 13. It’s a part of the Love Does Giveaway for Valentine’s Day, and you could win the Love Does prize pack when you send us a story of how you’ve shown love to someone! Meet Jenna, a 10 Year Old Dairy Farmer!